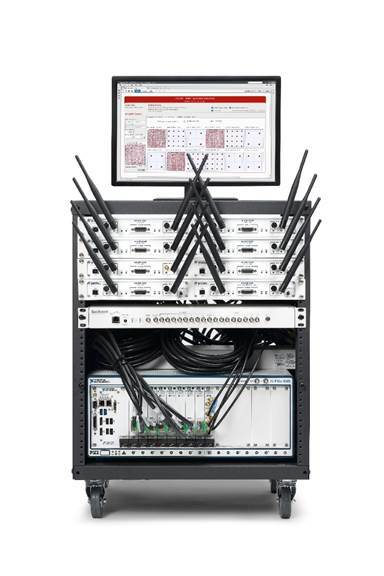 LabVIEW MIMO framework now supports multiple antenna user equipment for fully functional 5G deployment opportunities. National Instruments has announced multiple antenna User Equipment (UE) support for its LabVIEW Communications MIMO Application Framework. This makes the MIMO Application Framework the world’s only commercially available physical layer reference design that powers true Massive MIMO prototyping that goes beyond just desktop simulations to fully functional 5G deployments. Researchers can now explore beamforming techniques not just at the base station, but also at the UE to further improve overall network throughput, extend cell coverage, reduce interference and more. The MIMO Application Framework supports a maximum network throughput of more than 1.5 Gb/s, a flexible and reconfigurable Time Division Duplex-based frame structure and a fully bidirectional communications link that can be used out of the box to conduct Massive MIMO experiments and seamlessly integrate custom signal processing algorithms in a fraction of the time compared to other approaches. As participants in NI’s RF/Communications Lead User program, wireless researchers at Lund University in Sweden have used NI’s flexible prototyping platform for 5G research and have recently demonstrated the feasibility of Massive MIMO under mobile conditions for users moving at both pedestrian and vehicular speeds.